The photo I am sharing with you is from my mother's garden and is of crocus, the flower that carries the most expensive spice in the world as its stigmas. Yes, my mother grows saffron in her backyard. How she got the plants I cannot share with you, at least not in my blog. I can just say that it involved some serious planning from my aunt in Iran, my mother's friend in France and of course the mastermind herself, my mother. I was fascinated to learn that it takes the stigmas of 75,000 blossoms, an acre of flowers, to make one pound of the spice. And they must be picked by hand. 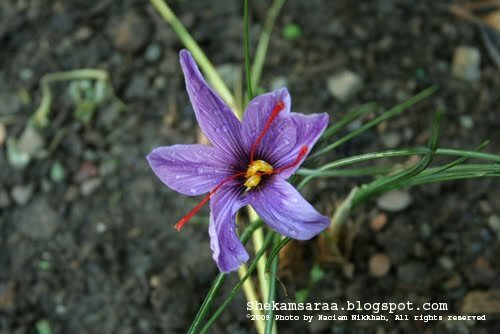 When buying saffron it is recommended that you purchase the threads instead of the powder (which tends to be mixed with turmeric). To prepare it use a spice grinder or mortar and pestle and grind them with a sugar cube. The sugar cube helps in the grinding process. To make liquid saffron, dissolve 1/4 teaspoon of ground saffron in 2 to 3 tablespoons of hot water in a small cup. Cover and let it steam for 5 to 10 minutes. عکسی که بالا میبینید از گل زعفرانی هست که ملی خانوم، مادر عزیزم توی باغچه اش پرورش داده. داستان اینکه این پیاز زعفران چجوری به دست ما رسید خیلی طولانیه. فقط این رو بگم که عمه نیره از ایران با همکاری دوست مشترکش با مادر بنده در فرانسه به هر قیمتی که شد این زعفران ها رو از گمرک آمریکا رد کردن. برای تهیه زعفران آب شده. نصف قاشق چایخوری زعفران ساییده شده را توی ۲ تا ۳ قاشق سوپخوری آب جوش حل کنید. روی ظرف را بپوشانید و بگذارد زعفران برای ۵ تا ۱۰ دقیقه دم بکشد. Khahare man ya madare gole Leilee dar dashtane estedade khas wa salighe, sawabeghe besiar derakhshani darad wa angoshte besiar niaz darad wa 20 ta angoshte dast wa payash baraye honar hayash kafi nist. Az hamegi khaheshmandam ta montazere kar haye monhaser be farde baadi ash bashid.